When I arrived at Huawei's headquarters in Shenzhen, South China's Guangdong Province, on Monday, I heard that the Chinese company is ready to sell 5G chipsets to US technology giant Apple despite the US-led global crackdown on Huawei. I was not surprised at all. The US government's reported move to pursue a criminal case against Huawei for stealing tech secrets has been lifting the air of mystery around the private company that has kept a low profile for years. Founded in 1987, the firm has grown into a global technology enterprise and the largest telecoms equipment provider worldwide. At its massive Shenzhen campus, hundreds and thousands of visitors from all around the world come to take a look at its "secrets" of success every day. While the US accuses the Chinese company of posing security risks to other countries by installing backdoors on its networks and collecting data for the Chinese government, Huawei has not been intimidated by these offensive tactics. On the contrary, it opens its labs and production lines to the public, turning this fierce pressure from the US into an opportunity of being more international. Serge Haroche, former Nobel Prize laureate who visited Huawei's Shenzhen campus on Monday, told me that he was impressed by its research and development (R&D), as well as the company's spirit of supporting fundamental scientific research. Inviting well-known scientists to Huawei and forming a long-term partnership with universities and research institutions are part of Huawei's corporate values, and its founder Ren Zhengfei has shown respect for scientists and values fundamental research. Heavy input into R&D helped it achieve major breakthroughs in domains such as semiconductors, wireless and artificial intelligence technologies, and it has also established one of the largest patent portfolios in the world, with a total of 87,805 patents granted. It all explains why Ren is confident that Huawei is capable of selling 5G chipsets to Apple, as the Chinese technology company is now moving faster than Apple in innovation, and its ambition of overtaking the US technology company would not be intimidated by a US ban. This is my third time in three months to visit Huawei's campus, and many reporters like me from domestic or foreign media outlets come to take a closer look at it, showing that Huawei has nothing to hide from, and nothing to fear. Some observers think that Huawei is a hostage amid the China-US trade war, and the US government is unlikely to drop its Huawei prosecution, as tensions will not be eased in the short term. 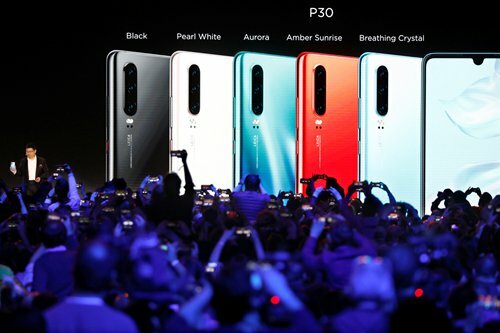 Under the spotlight, the Chinese company is moving ahead at its own pace, as political noise will not stop it from bringing new technologies to the world. More Western countries such as the UK and Germany have refused to block Huawei from 5G roll-outs by resisting US political pressure. I see it as a positive outcome of its continuous efforts in collaborating with third-party organizations to demonstrate its openness and transparency. In addition to its cyber security cooperation in the UK, Canada, Germany and France, it opened a new center in Brussels, heart of the EU policymaking process, in March where it has invited other institutions to test its source code. Step by step, Huawei, as a major player in the global telecoms industry, has been proving itself to be trustworthy and innovative. In this US-led political crackdown, it's also widely believed that Huawei will win more hearts and minds as a global leader in the 5G era.